Megan, the creative mind behind Country Cleaver, says of her pretty recipe: "For a quick and simple dessert, my favorite way to eat pears is in a quick pear crisp – it takes 20 minutes to bake, and with just a few pears on hand, you can feed a crowd in a rustic way with no muss and no fuss." On a cutting board, slice pears in half. 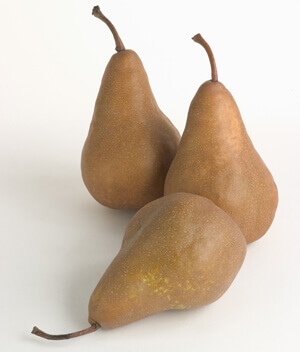 To ensure that the pears lay flat while baking, slice off a small piece on the outside of each pear. The middle of the pear should be facing up. With a melon baller or spoon, scoop out the seeds of the pears. 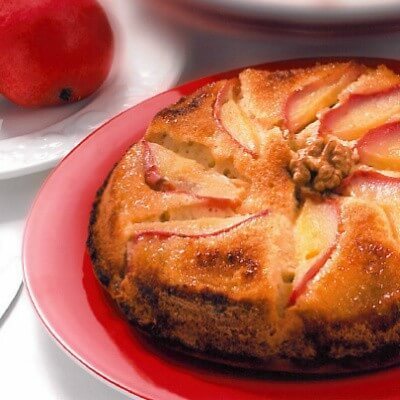 Place pears onto a baking sheet or in the bottom of pie dishes. In a medium bowl, whisk together all dry ingredients. With a pastry cutter, cut in butter until crumbles develop.